Invisible and energetic wavelengths made up of UV-A, UV-B and UV-C rays. 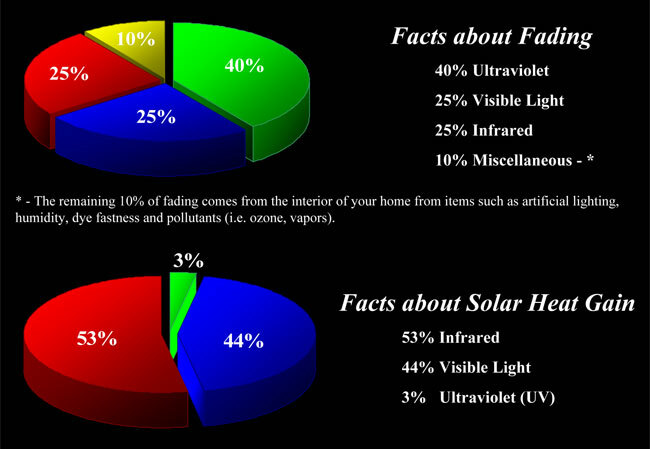 While UV-C rays are filtered by the earth’s atmosphere, most people are concerned with UV-A and UV-B rays. Madico films will block 99%+ of these harmful rays. The only part of the spectrum visible to the naked eye, visible light is the one factor that most people can recognize right away. Visible light represents 44% of the sun’s radiant energy and 25% of the causes of fading. The final segment is made of rays we can feel but not see. These invisible rays represent the largest source of the radiantenergy 54% and also contribute to the causes of fading (25%). Madico offers various types of window films to control each of these three factors. Consult with your authorized Madico dealer for the best window film that meets your specific needs.